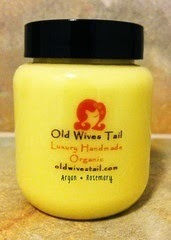 Old Wives Tail makes handmade hair treatment products. The recently sent me one of them to try. This product came in a little plastic jar. (Adorable!) When I opened it the first thing that hit me was the wonderful smell. It smells yummy! The product is a very thick whipped creamy texture which you apply to your hair as a treatment. You leave it on for about an hour then rinse out. You can also apply a small amount to the ends as a leave in conditioner. I felt like this was a very luxurious product. My hair felt soft and nourished after using and smelled amazing. Our organic oil treatment is completely chemical free and 100% natural making it very gentle and kind on your hair and scalp. Our oil treatments strengthen, thicken and nourish the hair making them the perfect natural remedy for dry, damaged, broken and brittle tresses. They smell absolutely divine! We use stimulating and refreshing essential oils that give our oils their amazing scent.